Right now you probably have a good idea of the condition of your home, from top to bottom. If you’re coming up short above the roofline, the fix could be as simple as a Warmzone electric radiant heated roof or gutter system. During the winter months, ice and snow build up can have a devastating effect on your roof, causing gutters to sag and shingles to break free. The good news—an electric radiant snow melting system can eliminate this damage without emptying your wallet. Just what can a good roof deicing system do for you? A well-fitted, properly installed radiant heat snow melting system along your roof line will eliminate prolonged ice-damming during the winter months. 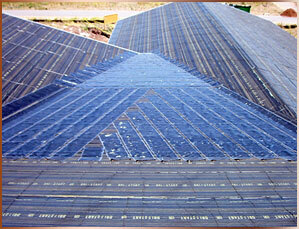 Eliminating ice damming, in turn, can prevent unwanted seepage through roofing materials into roof decking. This can cause some serious damage to the roof before finding its way inside to damage ceilings, walls and floors, resulting in mold growth. A Warmzone roof deicing system is the optimal solution for melting snow and ice from roof eaves, valleys, even entire roofs. Heating Element – The low-voltage roof heating systems feature a heating element, which is placed in a Mylar encased and installed underneath the shingles. The roof gutter trace systems feature self-regulating heat cable that is placed in the gutters and downspouts to keep gutters free of snow and ice. Power/Control Unit – The controller monitors power and output to ensure safe, accurate, optimal system performance. The power unit monitors the heating element under the roof to melt snow and ice, protecting your roof from ice damage. An activation device (snow sensor) – Warmzone offers different types of sensors. The aerial sensor (which is typically used for roof heating systems) is a gutter-mounted snow switch. Like the aerial sensor, the pavement mounted sensor also detects precipitation and temperatures to signal the controller when conditions warrant. However, this sensor is installed in the pavement (and is used more for heated driveways and snow melting systems than roof deicing. Both sensors provide fully automated snow melting for your roof deicing system. Warmzone roof heating solutions are customizable for just about any roof type and configuration. And Warmzone is the recognized industry leader for providing one of the largest selections of state-of-the-art radiant snow melting systems, including electric and hydronic options. Unlike other “one-solution-fits-all” providers, Warmzone bases a solution on your budget and specific needs to deliver the best performing roof deicing, driveway heating, or floor heating system possible. Determining the ideal heat cable, thermostat and sensor for your roof heating job depends in part on the size, type and construction of the roof, and also on the overall requirements of a particular installation. Warmzone is always available, with the experts and expertise necessary to assess your system and determine what you’ll need to optimize overall performance for your home. So, if you’re ready to pull the trigger on a roof deicing system, give Warmzone a call at 888-488-9276 to discuss your options.